In 1700 the Cascadia earthquake occurred along the Cascadia subduction zone on January 26 with an estimated moment magnitude of 8.7–9.2. The megathrust earthquake involved the Juan de Fuca Plate that underlies the Pacific Ocean, from mid-Vancouver Island in British Columbia, Canada, south along the Pacific Northwest coast as far as northern California. The length of the fault rupture was about 1,000 kilometers (620 miles) with an average slip of 20 meters (66 ft.). A slow earthquake is happening under Puget Sound right now, which increases the risk of a Cascadia subduction zone earthquake. SEATTLE, WA — Although the risk is slight, it might be a good time to check your supply of food and fresh water. That's because the region is entering a period when the risk of a megathrust Cascadia subduction zone earthquake is slightly higher. On Wednesday, the semi-annual "slow slip" event began, according to the Pacific Northwest Seismic Network (PNSN) at the University of Washington. The event happens about every 14 months deep underneath the Puget Sound area and is essentially a slow earthquake that takes place over the course of two weeks. During a slow-slip event, after 14 months of moving eastward, the Juan de Fuca tectonic plate stalls and moves westward, which puts stress on the Cascadia subduction zone. Seismologists often refer to this as a "straw that broke the camel's back" scenario. "It's loading up the edge of the lock zone of the Cascadia subduction zone more rapidly than normal tectonic processes would do," explained Bill Steele, director of communications at the PNSN. "You're getting seven months of strain accumulation applied to the back edge of the fault over a week." The probability of a Cascadia quake goes up during a slow-slip event, but just slightly more than during other times of the year, Steele said. Still, it's not a bad idea to check your emergency plan and make sure you're ready for a large earthquake. Right now, there are small tremors vibrating up and down the eastern edge of the Olympic Peninsula. The small tremors happen every few minutes. You can see a live scroll of tremors on the PNSN website. There's also the risk of other types of earthquakes. On Wednesday night, a magnitude 4.2 earthquake hit near Belfair, about 34 miles west of Seattle. That's a relatively large quake for the region, and it could be a precursor to a larger earthquake along a local fault. Over the next 48 hours, there's the risk of a larger 5 of 6 magnitude quake. The Seattle fault, which runs from Fall City through Seattle to Bremerton, is capable of producing a powerful magnitude 7.0 quake. A full rip of the Cascadia subduction zone would be a devastating event up and down the West Coast. 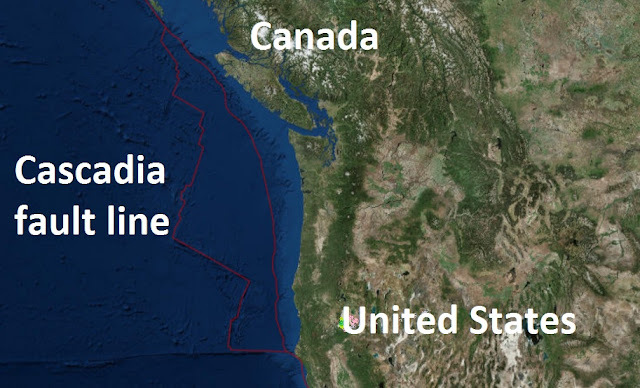 The subduction zone extends from Eureka, California, to mid-Vancouver Island. A Cascadia event could cause up to a 9.0 magnitude quake with intense shaking lasting up to five minutes. The shaking would level un-reinforced buildings and roadways, sever utility lines and rupture gas and oil. Jesus had something to say about the increase of EQ's in the last days in Matthew 24. That is why I pay close attention to articles like this one. We certainly do seem to be experiencing an increase in both frequency and intensity. Like birth pangs, from 0 to 7 takes forever with false pains here and there, then the intensity and frequency escalate in transition, and it isn't long, often only minutes, till crescendo, the thing cannot be stopped. No turning back. Which is why we do well to pay heed to what is happening around us, precisely as foretold in Scripture. To not see it is wilful, surely. Thanks for the info!! !